E-Zee Tear® Plus - Crisp 1.8 oz. is a medium to heavy weight Tear Away stabilizer. It tears away cleanly and crisply, leaving minimal excess stabilizer. Use for medium to high stitch count designs with medium to heavy weight woven fabrics. Tear Away stabilizers are best used with stable, non-stretchy fabrics. 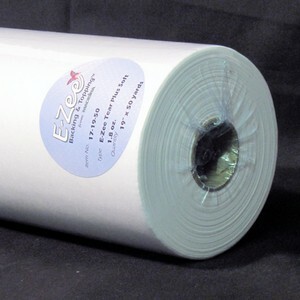 Cut a piece from a roll or use a piece of pre-cut E-Zee Tear ® Plus-Crisp to fit your hoop size. Hoop by placing the stabilizer underneath the garment. Embroider the design and remove the embroidered item from the hoop. Carefully tear the excess stabilizer away to avoid excess pressure on the design.